Welcome to a very special edition of the Necrocasticon, our landmark 200th chapter. 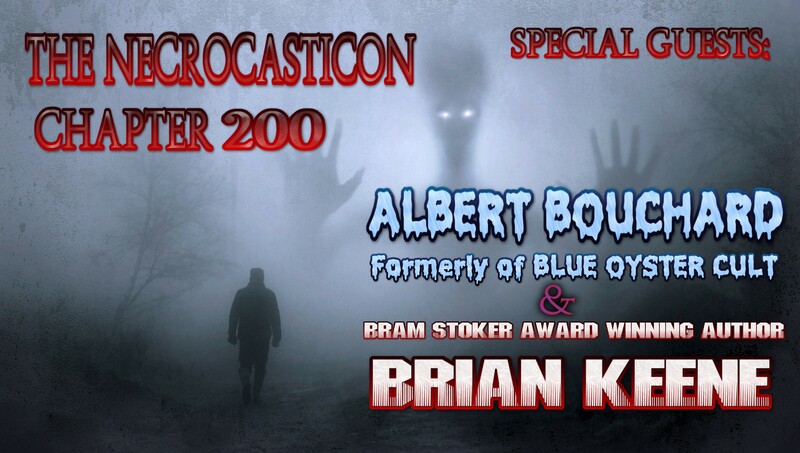 Tom, Scott, Walt & Dan welcome our biggest guests ever in Horror and Metal, as we talk to Bram Stoker Award winning Author Brian Keene and the man behind Cities on Flame: Albert Bouchard, formerly of Blue Oyster Cult. This is Volume 4, Chapter 45 of the Necrocasticon, the penultimate episode before we break our milestone 200th chapter! And we're getting bizarre when Scott and the panel interview Mike Vaughn, the author of The Ultimate Guide to Strange Cinema. Volume 4, Chapter 44 of The Necrocasticon welcomes Andy Parsons from Brick By Brick to talk about their new album.